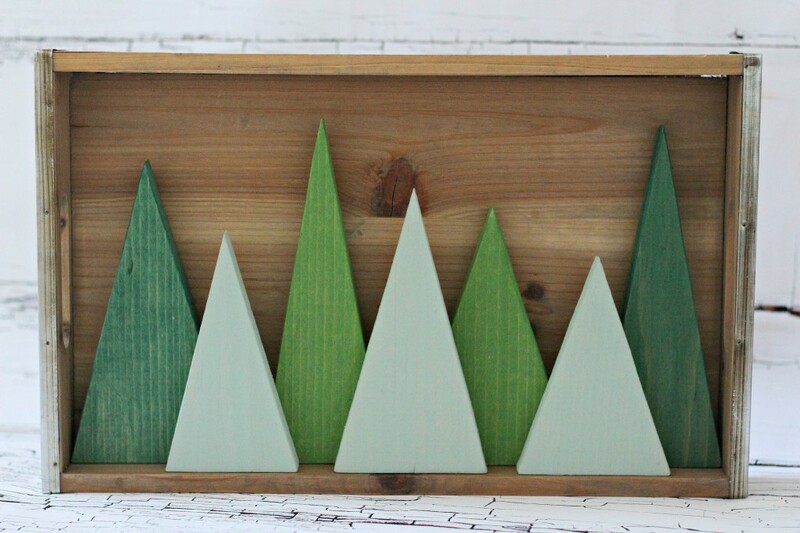 I love making decorations for holidays and seasons that can be interchanged, so I came up with this simple Shadow Box Forest for Christmas and Winter. 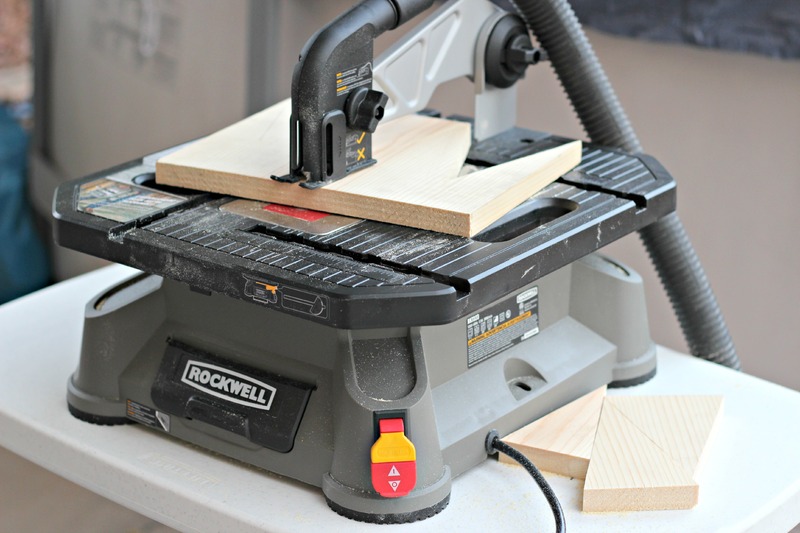 It is the perfect project to ease me into using power tools without my husband having to help me. If you follow me at all you know that my style has gotten rather simplistic. 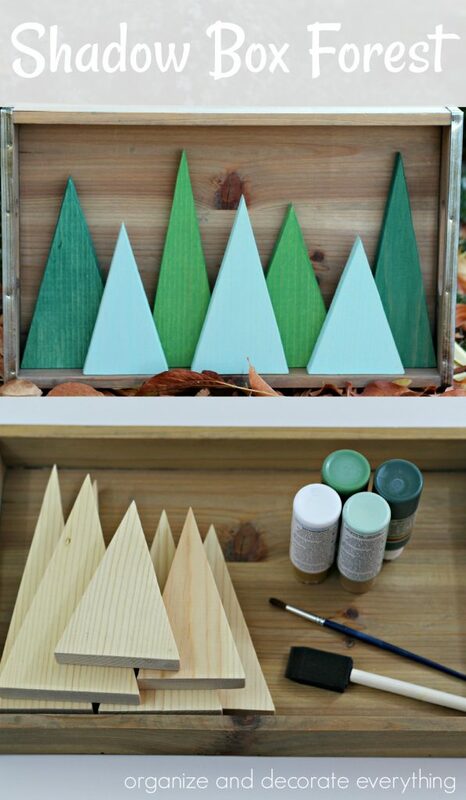 I decided to create a forest that was simple with clean lines to add to my already existing Winter decor. Follow the directions below if you would like to make your own forest. Start by measuring out the triangles to make the trees. I made all of mine different sizes, some are tall and skinny and some short and fat. 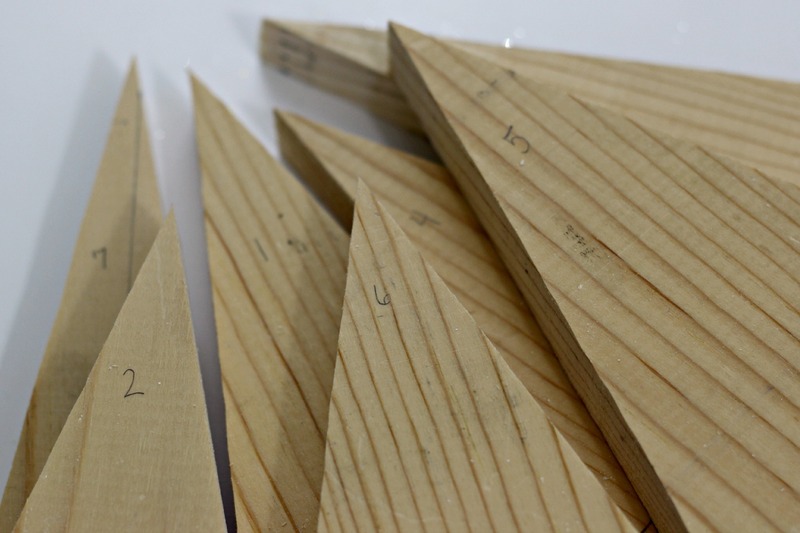 The tallest is 7 1/2″ and the widest is 4 1/2″. Do what will work for your space or what looks good to you. I used scrap pieces of wood for this project. I was so excited to be able to use my new BladeRunner x2 for this project. I would normally use my miter saw but this was so much quicker and easier. I attached the shop vac to the saw to catch the saw dust. 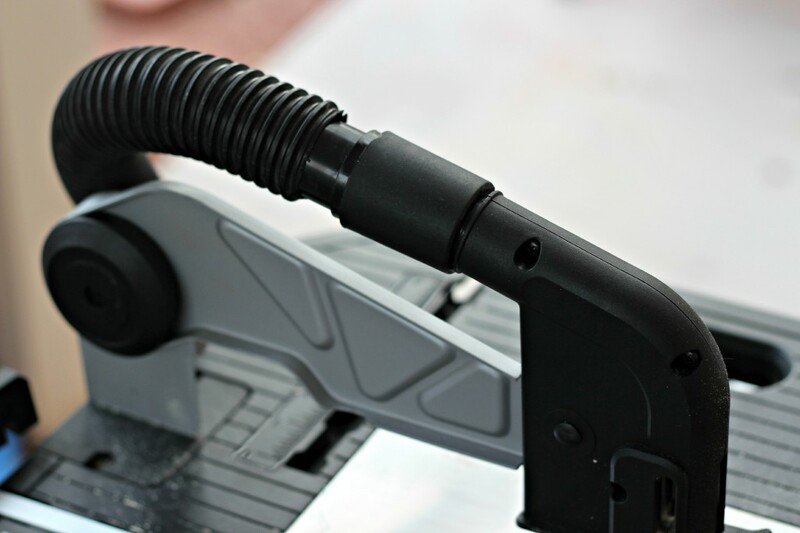 It worked like magic to keep the dust away from the blade so I could see my lines and it was really easy to attach. I love how fast I was able to cut the trees out. I decided to start with something simple since I’m not really skilled with a saw but this project was so easy that I can’t wait to make more projects for upcoming holidays and gifts. I have a large collection of trays so I decided to use one of them for the shadow box. 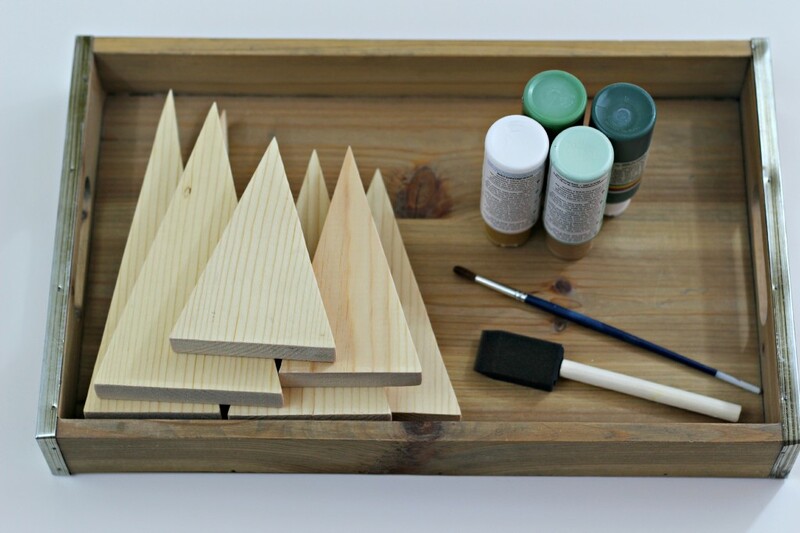 You can use any tray or simply use a flat piece of wood to hold the trees. 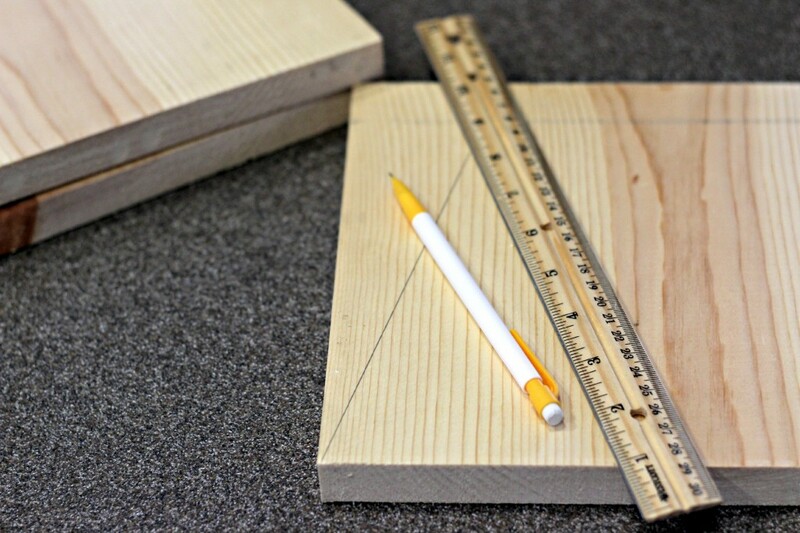 If you use a piece of wood you will need to glue them in place, with a tray you can just set them in place. I cut out 7 trees and placed them in the tray in the arrangement I wanted. Once I knew where I wanted the trees I numbered them on the back, then lightly sanded them. Now it’s time to paint. 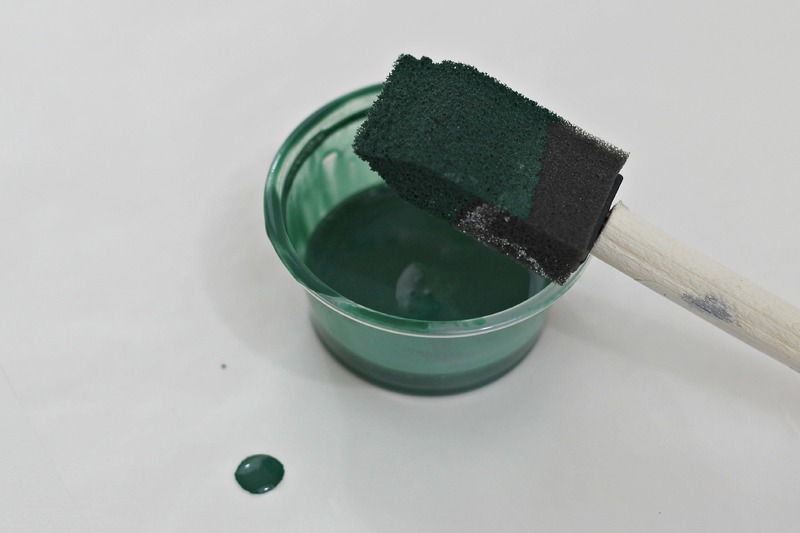 I wanted the wood grain to show through so I diluted the paint with water using a 1:1 ratio. I lightly painted each tree with only one coat of paint to see the wood grain. It is more like a colored stain now. I used paint I already had so that’s how I ended up with these colors. I really like how they look altogether. I might make more of all different colors for the mantel. At this point you could add white dots using the bottom of a paint brush to represent snow. I decided not too but it would add more color and dimension if you decide too. You could also add some glitter to add a little sparkle if you like. It’s such a simple project but I love the impact of all the trees together. great giveaway! i would make wall shelves. Probably some kind of shelf to test it out. I am really wanting to make an old fashioned heavy-duty picnic table. You made something so cute look easy to do….makes me think even *I* could do it! I’d love to make some simple, rustic decor for our house. i’d cut some trim for my kitchen. I’d like to try making my own frames for artwork. Love the tree idea. The Bladerunner looks incredibly useful! I would make some shelves for my son. This amazing project that you just shared! So cute!! I need some wall display shelves in my office. I would love to make a necklace hanging rack for my jewelry! wow, I love to make a key holder with it! I love tools and adding some to my workshop would be awesome. My granddaughter and I love to craft together so this would be of great help to us! I have some reclaimed wood from an old farm house. I would like to make some boxes and frames. I would love to make birdhouses and a storage unit for my jewelry. Great Giveaway! Fingers Crossed! Happy New Year! Crystal Wall recently posted..Merry Christmas To All! I would make some frames for some photo canvases. Thanks for the chance to win such a great prize! I love your shadow box so much I’d probably start with one of my own. This looks so great! I would make the “shadow box forest” for my first challenge. Then, hopefully I will be off and running. 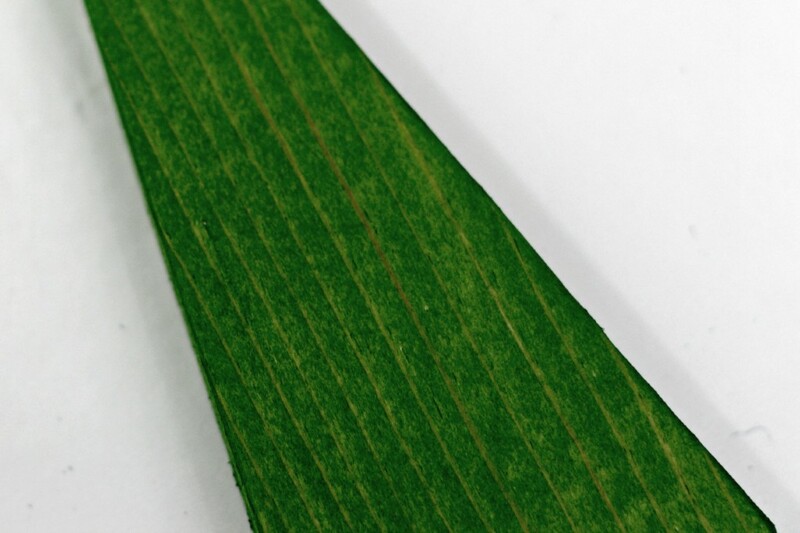 I would love to create a unique idea for office supplies. This is so cool. I would use it to create bases for my wood burning projects. we just bought an old house. I would use it to make so many things!!! I think I would start with some frames to stretch fabric on. I like your idea for the shadow box. I would create something similar with a moon and star theme. 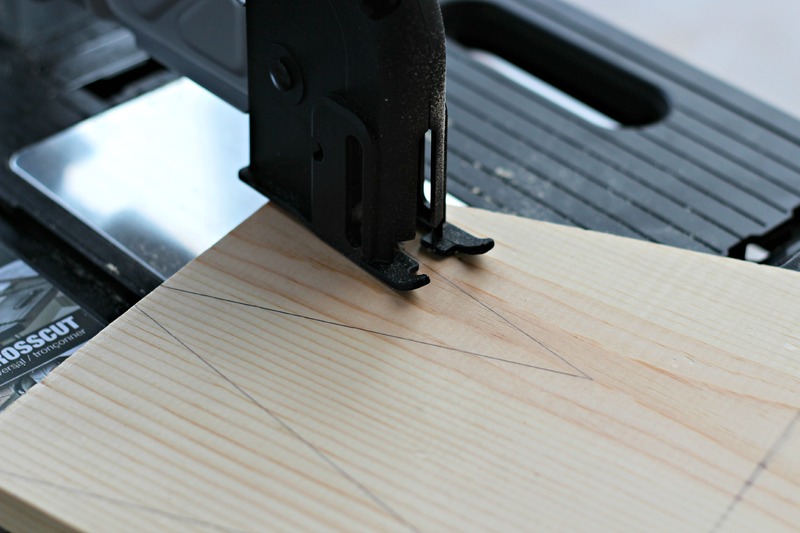 I’d love to make some heart shaped cut outs as part of my Valentine’s day decorations. They’d be so cute to paint. I’m a new DIY’er and any of these would be great to start off with. I would haul this bad boy to help built props for my daughter play. I could probably haul one less bag of tools with me. The versatility and the size of the Rockwell is amazing. 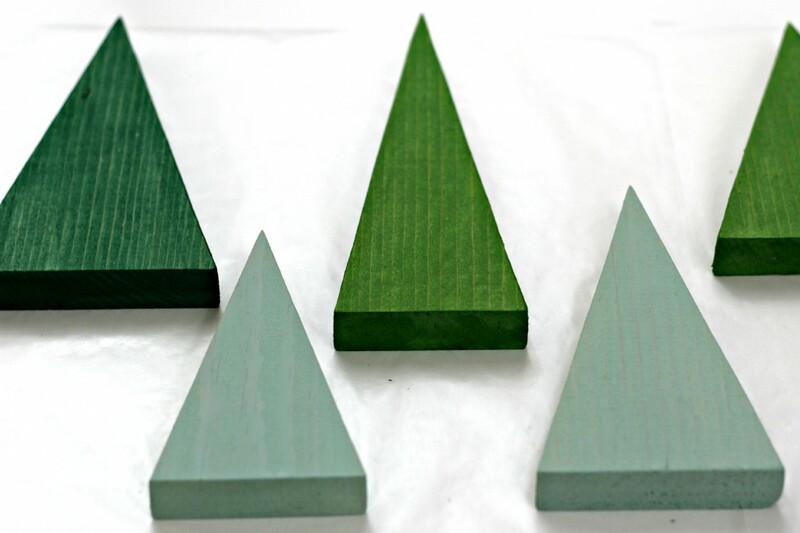 I’d love to make these little trees at some point but first I’d like to make a thread rack for my sewing room! My kids have made me all sorts of art work on canvas this holiday break, I woyuld LOVE to frame them up!!!!! PLEASE PICK ME!!!!! I NEED to win this super bad! I would attempt some simple second shelves to utilize the vertical space in my closet. I want to make some frames for the Maui pictures I want to give to my husband for his office. I would make shelves for the kids’ rooms, especially now that they have little things from Christmas that need to be up off the floor. I would make display shelves for my boys Lego creations. I would copy your winter trees shadow box. Don’t laugh but I need to put a cat door in my laundry room so my dog will stop eating our laundry!! I’ll make a wood rack for my dad and a target for my nephew! i would make some craft storage bins for my cube system i have! Well I adore that shadow box you made and I also need to make some shelves for my sons’ closet. Fist thing I’d make would be a headboard for my daughter. It cuts tile! A backsplash is definitely the first thing I’d do. I would love to make a wood project for every holiday. Awesome giveaway! I would probably make a decor item for Valentine’s Day. Some sort of artwork for Valentine’s Day! Some cute shelves for my craft room. I actually think I would make the same trees that you did! I love the way they look! My boyfriend wants to make a lamp! I would make some mantel decor! A wooden box similar to an old soda pop box. I would definitely make those trees…LOVE trees! I would make an old fashioned wagon for my daughter, she has been asking for one for a long time. I would make some frames for stained glass panels. I have a TON of projects I would use it before. But, I really love what you made. I would probably start there. Looking to create some boxes, shelf, and hooks for organizing! Not sure if my previous comment went through. Here it is: Looking to create some boxes, shelf, and hooks for organizing! Your trees are so cute! I love that idea! I’d make some hexagon wall decor for Spangenbaby’s nursery! First I’d make myself a pantry cabinet! Oh I LOVE my BladeRunner!!! It is the best! Your project turned out so super cute! I love it! I would make window trim! Not as cute as your project, but great for the windows in our remodel project. I’d teach my mom how to use it so she could build some of the things she keeps pinning on Pinterest. Most likely a squirrel feeder. I would make a Valentine’s Day front door display. Wow. I would make a bench. I have the design saved and I could really make it if I won. Thanks for the great giveaway. This would be for my son and I believe he would make his wife a nice country shelf she has been wanting! 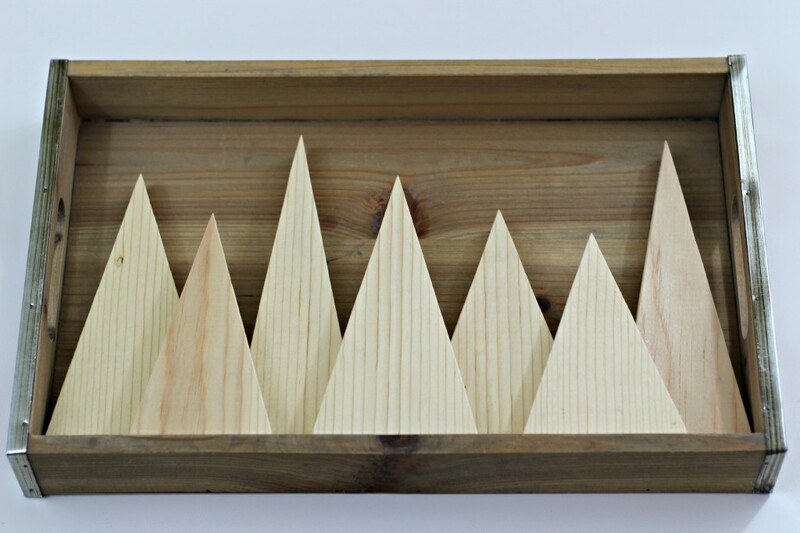 This looks like the perfect tool for making custom bookcases for my collection. The Blade Runner looks to be simple to set up and use… perfect! I would make a dulcimer. I would give this to my dad. I’m sure he has tons of stuff he’d like to make. I would build a shelf for my room! I would make new shelves for my sewing/craft room. Id like to try to make my grandson a small toy box and I need to make a large picture frame. I am hoping my husband will make me a cabinet for my sewing threads. Have a Happy New a Year! I would like to make a shoe rack for my closet. I would probably make a shelf. We will be replacing our kitchen floor in the spring, so this would be perfect for cutting the edge and corner pieces. I would like to make some new shelves for my laundry room. The tree project you made is awesome! I would probably make that! We also need to do some trim work in my house, so it would get a lot if use. a toy box and shelves! We’ve been thinking about making a cat tree for our kitty, so I think we’d give it a go if we won this. I need to reframe some light fixtures. I think I would start with something simple like a picture frame. I would make some Valentine’s Day decor! I would make some kitchen cabinets for my parents. I think I’d make a wooden wreath for our entrance door. I have some old painted red windows I would love to make end tables out of. Thanks for a great giveaway! Looks like you got great use of the bladerunner. I can imagine 841 things I could do with it. So fun! Great job Leanne!! You make it look sooooooo easy!!! I’m totally in love with this tree project of yours. So adorable! I wish I have stumbled upon this post earlier and and got the box myself.